E. Sue Huff & Associates, Inc.
BARBRA J. REED, D.M.D., M.S., P.A. "Making contact every day to satisfy my buyers' and sellers' needs." She uses cutting-edge technology, the latest digital know-how and even drone photography to showcase her listings, but when it comes to making the deal, Kelly Capolino relies on old-fashioned face time. 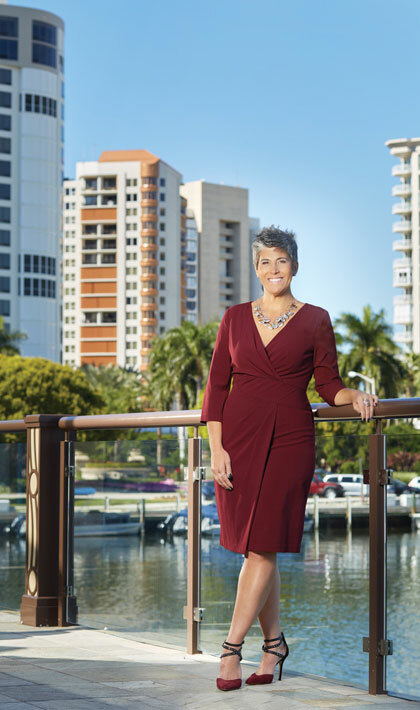 Dynamic and personable, Kelly says that despite adopting the latest innovations impacting real estate, knowing her clients personally is critical to her success. "The internet and electronic communication is definitely necessary. But that one-on-one touch is very important in real estate. The more personal contacts I make, be it on the phone or in person, the more quickly my clients' properties sell — and the more quickly I can monitor changes in the market." Known for her ability to negotiate and get the best deal for her clients, Kelly says it is the joy of meeting their needs that drives her passion for excellence. "Whether my client is a CEO of a major corporation or a first-time home buyer, they deserve the same work ethic and my energy!"